Sinjin Smith is a 1996 Olympian, 5-time World Champion, 7-time U.S. Champion, and 4-time Manhattan Beach Open Champion. When Smith was a senior at UCLA, Karch Kiraly was an incoming freshman. Smith immediately recognized Kiraly's potential and paired himself for team drills and volleyball strength training exercises. Back in those days, there wasn't rally scoring. A five-game match could last up to three and half hours. The UCLA team was usually in better shape than there opponent because of a daily strenuous volleyball conditioning program. Smith and Kiraly had the luxury of competed against one another on a daily basis. They competed on who could do the most push ups and sit ups. They had contests on who could sprint the fastest and jump the highest. Their pepper games were extraordinary because of how hard each one could spike the ball and how fast each would anticipate and react to the spikes. 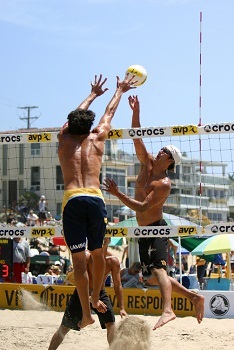 Christopher St. John Sinjin Smith is regarded as one of the greatest beach volleyball player's of all time. Smith is noted as the original King of the Beach. He's considered the most important contributor to the development of beach volleyball and putting the sport on the map. In 1977, Sinjin played in his first career event with Ron Von Hagen and won his first event that same year with Mike Norman. Since that first event, Sinjin has claimed 11 International and World Championships in his 23-year career, more than any other player. He has twice won King of the Beach Invitationals, the Tournament of Champions and is a multiple winner of the coveted Manhattan Beach Open. Sinjin and Randy were named the FIVBs Greatest Team in Beach Volleyball History at a ceremony in Buenos Aires, Argentina in 2001. In 1996, Smith and then partner, Carl Henkel, became the first American team to qualify for the debut of beach volleyball as a full medal sport at the 1996 Atlanta Olympics. "When you get to the end of the tournament, the skill level is pretty much the same. So what makes the difference? Who lasts the longest and who's the strongest mentally." "Rarely was the crowd on our side." "We had to beat the crowd as well." "The game back then was called the "Sideout Wars"." "The easiest ball to hit is the one that goes up and down." "When passing, you want to make it as easy as possible for you (the hitter) and also the setter."